Max Kowalski, who lived and practiced law in Frankfurt am Main, was from 1913 till 1933 a well-known, much-esteemed, and frequently performed composer. Kowalski was born in Poland (then Russia) on August 10th, 1882 and grew up in Germany, to which his parents emigrated when he was a year old. 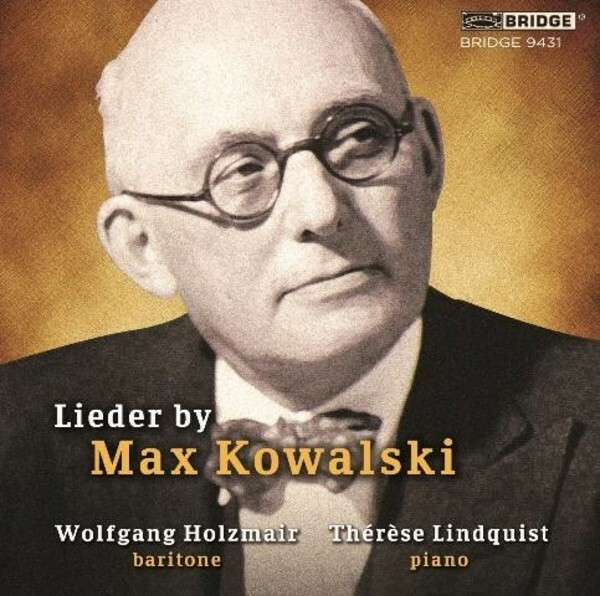 Kowalski's reputation rests on his production of more than two hundred art songs, which have been in the repertoire of many leading artists, including Heinrich Schlusnus, Maria Ivog�n, Paul Bender, Joseph Schwarz, Alexander Kipnis, Karen Branzell, and Hans Hotter. The present CD is drawn from a recital sung in 2011 in Munich by the great Austrian baritone Wolfgang Holzmair. It offers two song cycles and songs composed to texts by some of Germany's leading poets. The CD includes Kowalski's best known cycle, his Pierrot Lunaire, which appeared the same year (1913) as Arnold Schoenberg's settings.